With a few albums already under his belt, soulman Eli “Paperboy” Reed is switching gears from the secular to the spiritual. The genre switch also comes at a time when Reed is moving from a major label (Warner), an experience he summarizes as “frustrating but not necessarily malicious,” back to an indie (Yep Roc), which he describes thus far as amazing and a label that’s “malleable and responsive to artists looking for careers, not just hits.” However, don’t take his move to gospel as hipster revivalism. Reed has been a gospel junkie for years, thanks in part to his father who would regularly spin The Soul Stirrers and The Blind Boys Of Mississippi in his household growing up. After a stint playing organ with Mitty Collier, who recorded for Chess throughout ‘60s, for her Chicago church, he also was under the tutelage of longstanding New England gospel group The Silver Leaf Gospel Singers when he returned to his native Boston. Additionally, he’s been a featured guest and programmer on the Divine Chord Gospel Show. That he happened to record rhythm and blues before putting a note of gospel to tape isn’t new to the soul genre, as his singing and performances have always been influenced by spiritual music. Gospel music, while often thought of as a community experience when gathered at Sunday service, is actually the culmination of a very personal relationship in its creation and performance. Barriers are broken down, which is why you’ll often find people reacting to it through teary eyes, hand-raising or dancing in exaltation, maybe even in the same three-minute song. Reed has encapsulated those emotions beautifully in a succinct, yet full-serving, 35-minute record. There’s yearning, pain, belief, sin and redemption. For such a ripe and enriching experience, My Way Home almost didn’t happen, or at least not as part of some tactical plan. When church is functioning at its best, it’s serving. Through a program in Harlem called Gospel For Teens, which is set up to serve at-risk youth from the area, Reed has been volunteering in leading a small-group and quartet class when his tour schedule permits. Again, it was his father who played heavily into the picture. Working for The Manhattan Institute, which gives out a yearly grant, the elder Reed invited his son to check out the Gospel For Teens program, which had applied for a grant. Through these courses, which Reed has been doing since the summer of 2013, he felt a catharsis. “During the period after I left Warner, the class actually became one of the only steady things I had going on, and it really inspired me to start writing music again. In fact, it was a strong factor in leading me to the sound of what became My Way Home.” It was because of the program and through these teens, for which he expresses how proud he has been in their journey as singers and young men and women, that the album came to fruition. 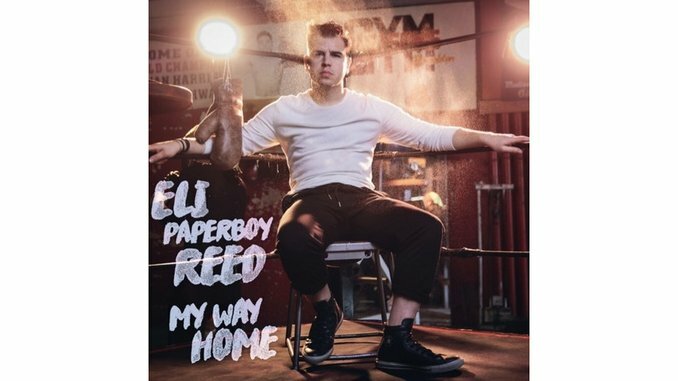 With My Way Home, Eli “Paperboy” Reed has joined a fraternity of faith musicians with the likes of his heroes such as The Violinaires, The Sensational Nightingales, The Mighty Clouds Of Joy, and The Brooklyn All Stars that serves the ears, the heart, the human spirit and the Lord. While using his own talents to help serve others, the best album of his career has erupted. This isn’t just a great gospel album to hear in 2016; it’s also among the must-hear albums across the musical spectrum.